The Nautipod came about because a good friend Joff had just built a Cornish working boat from scratch ( well from trees really) and was in need of a wood burning stove for dry heat on cold and wet days. He came to Hotpod HQ and Dan found a piece of 200mm square tube that looked to be just the job. 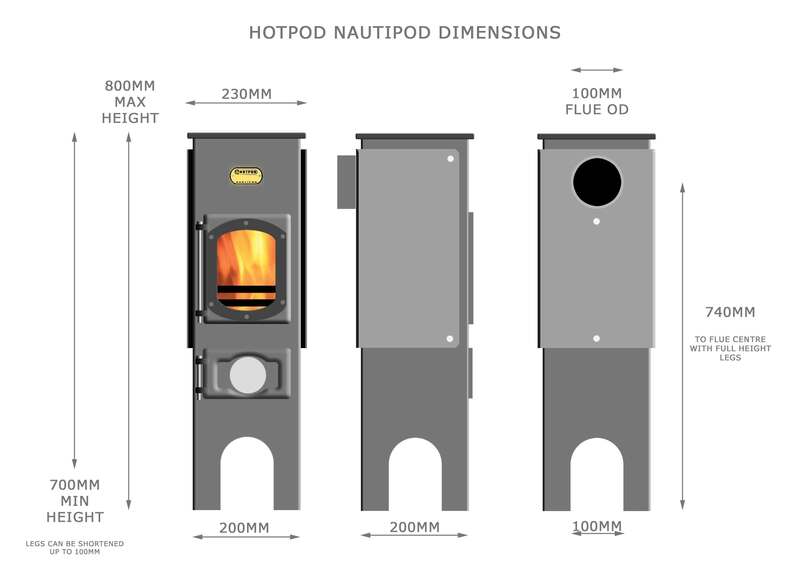 With a few Hotpod parts and an old bronze cog Joff had saved from an old boat gearbox, Dan knocked up the first prototype and Christened it the Nautipod. It worked so well on the boat that Dan decided to make some more but adjusted the design so it was simpler to fabricate (lesson learned from making round stoves for many years). A few people saw some Photos and very soon the next prototypes were in shepherds huts in Wales, another couple in Cornwall, a summer house near Trencrom and a gallery in Padstow. Number 11, Molly is heading off around the world in a custom built 4×4 VW truck. Starting with number 1 ‘Holly Mae’ they have so far all had girls names, a tradition that Dan is keen to continue. They are still all slightly different as Dan tweaks the design and the parts ( he ran out of bronze gears) but these are just cosmetic details as the basic design just works.